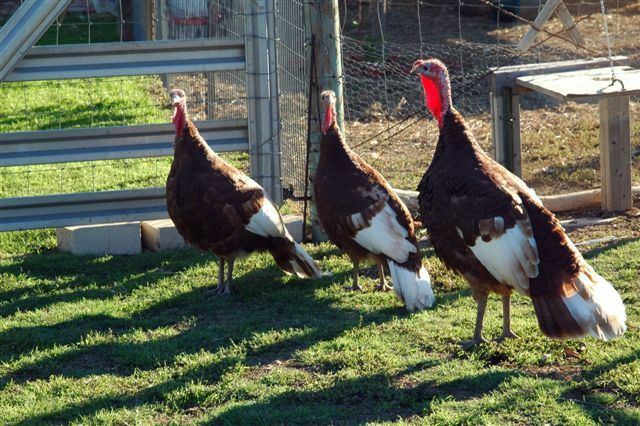 Bourbon Red turkeys are handsome. They have brownish to dark red plumage with white flight and tail feathers. Tail feathers have soft red bars crossing them near the end. Body feathers on the toms may be edged in black. 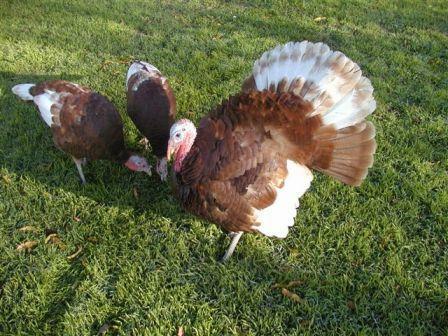 Neck and breast feathers are chestnut mahogany, and the undercolor feathers are light buff to almost white. The Bourbon Red’s beak is light horn at the tip and dark at the base. The throat wattle is red, changeable to bluish white, the beard is black, and shanks and toes are pink. Standard weights for Bourbon Reds are 23 pounds for young toms and 14 pounds for young hens.